Do you ever have days where you just have no idea what to do with your bullet journal? Try as you might, you can’t come up with any good ideas…. or if you do come up with a good idea, you have no idea how to make it look good? 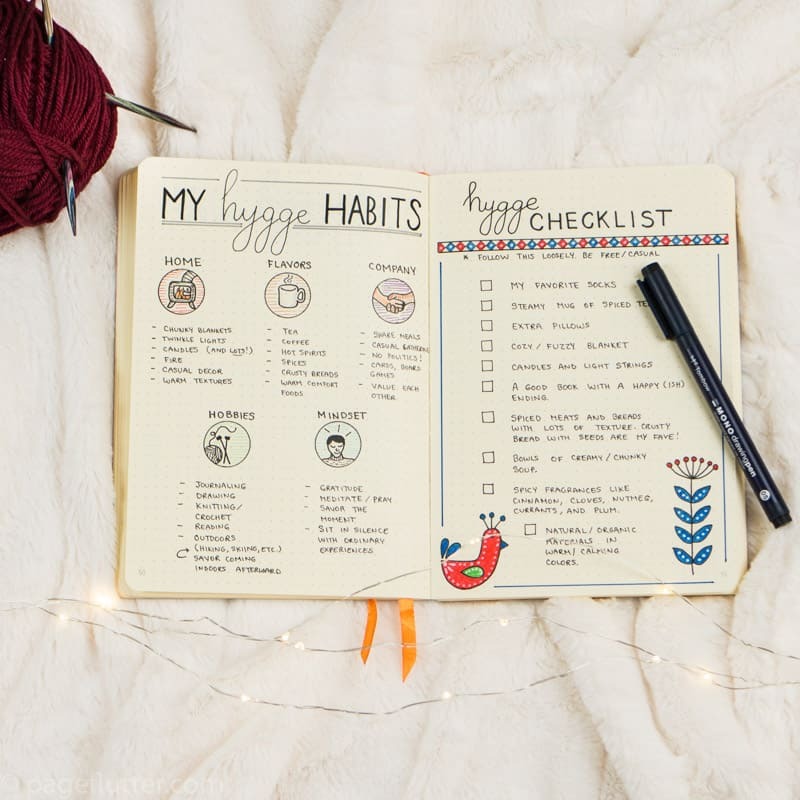 Following various bullet journal accounts is an easy way to get inspiration for those days where your bujo is bored, blah, or sad. Not only that, but the best inspirational bullet journal accounts can inspire you to take action, feel better, or try something new! This is why it’s SO important to have a core group of bullet journal accounts to turn to for help, inspiration, and ideas. With all the bullet journal accounts out in existence, it’s hard to figure out where to start (especially when you are new!). Even if you’ve been in the community for a while, you’ve may have your favorites already! But it never hurts to have some fresh accounts, especially if you’re looking to change things up (or if your favorite account stops posting!). What specific qualities make a bullet journal artist particularly inspirational? 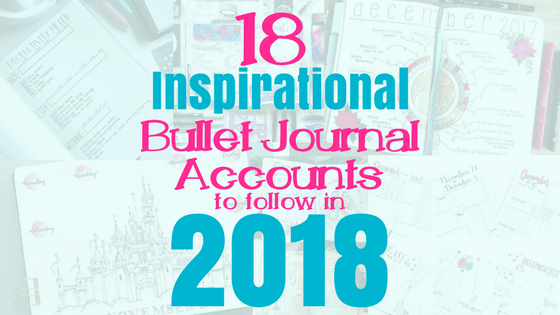 A post shared by Whitney (@lifebywhitney) on Dec 7, 2017 at 11:47am PST The best bullet journal accounts have many (if not ALL) of these traits! As we are going into the new year, there are going to be a large influx of brand new bullet journal accounts coming into our community. You may be one of them! If so, welcome! We are very nice people, I promise! 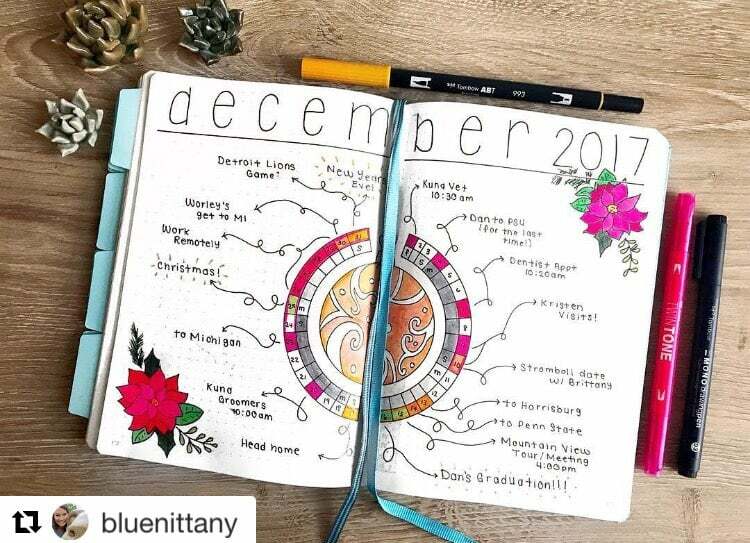 A post shared by Ashlyn (@bluenittany) on Dec 5, 2017 at 8:52am PST Being new to the bullet journal community can be overwhelming at first. Maybe you aren’t new to the bullet journal community, but you’re looking for some new sources to follow. Or possibly you’re feeling discouraged with your bullet journal. I’ve been in the bullet journal community for over a year now. I’ve had the chance to follow many different bullet journal artists throughout all corners of the internet. As a bullet journal blogger, I also have the amazing opportunity to work with a lot of bullet journal accounts directly. This means the inspiration comes to you in one super, convenient place! I Want to Inspire You! Whether you are new to bullet journals or established, you should find inspiration in one easily place. So, I compiled 18 amazing bullet journal accounts that will help get you (and your bullet journal!) inspired for 2018. I’ve also done something super helpful. I also recognize that each person learns differently. Our learning profiles vary greatly, and I want to make sure every type of learner benefits from this post. 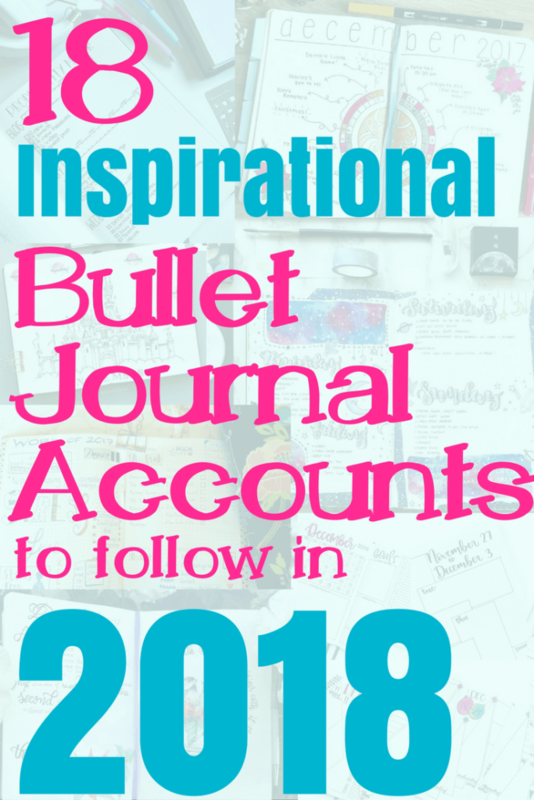 Many of these bullet journal accounts have a presence in many places (which I will kindly share at the end of each account’s feature). But I wanted to sort them out based off their key strengths in what they offer to the bullet journal community. The bullet journal accounts in this category share a primary presence within their websites and blogs. Many of the artists also have shops, featuring unique products to help you in your journey. If you love reading blog posts, make sure to take a moment and check out what each individual has to offer. And if you love what they offer, make sure to follow them on social media! You will find their most common social media accounts at the bottom of each feature. Whitney is so helpful for beginners. 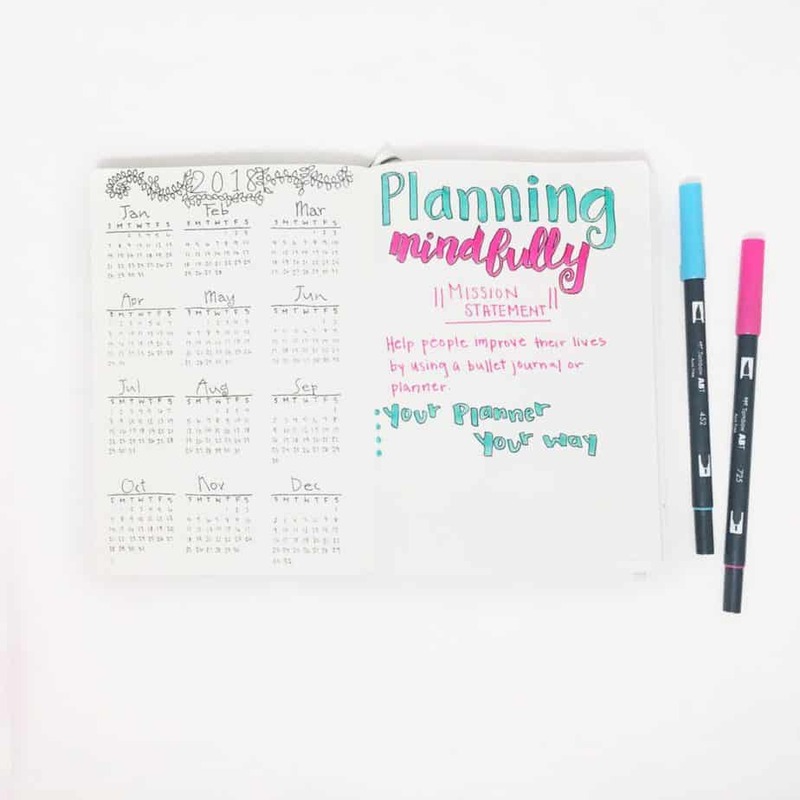 Not only does she offer really great advice and suggestions for both bullet journals and organization, she really goes out of her way to make sure you know exactly how to do it. Not only is she extraordinarily helpful, but she also creates layouts to help maximize your pages while having a lot of fun. Click to see this in Whitney’s shop! P&P has some terrific blog posts on Bullet Journals! In fact, if you like what I write about, you’ll enjoy her blog just as much! Jen offers content very similar to mine (time management related), but with different perspectives and experiences than my own. 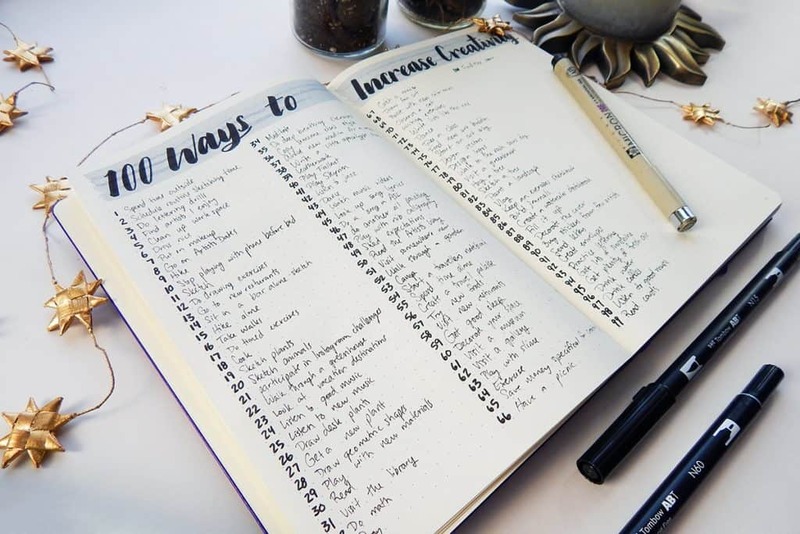 The other awesome part is that Jen not only writes about bullet journals, but she also has some terrific content on organization, crafts, and productivity. Megan is the founder of Page Flutter and she is an excellent artist and fellow bullet journal account. What makes her a standout account for 2018 is that her posts really encourage you to stop and smell the roses. I love her art and her desire for mindfulness. She implements less common techniques for organization, self improvement, and productivity. 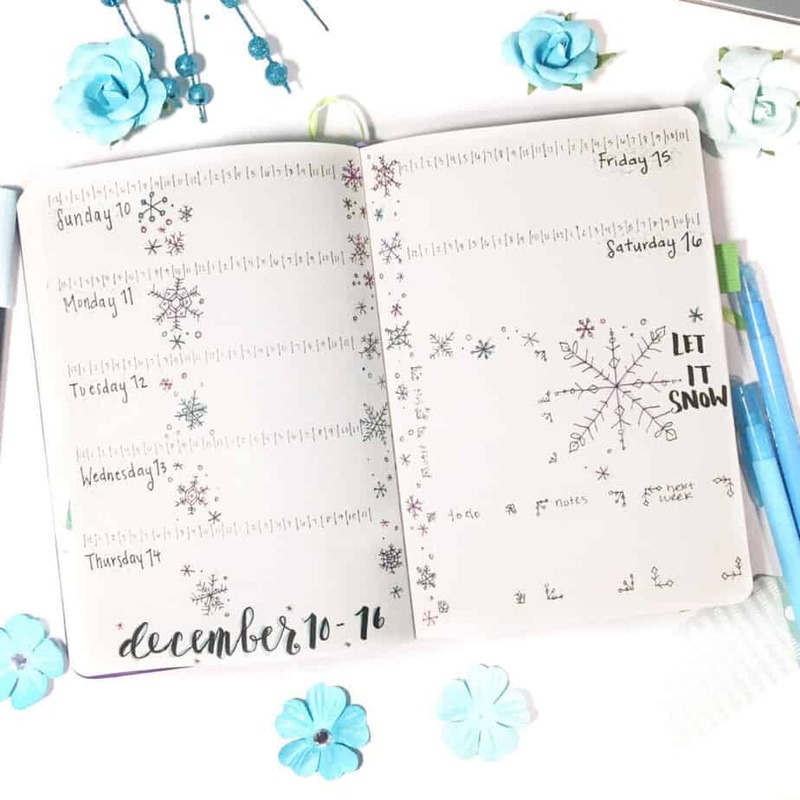 Click to see how Megan does Hygge in her bullet journal! I think she also does an exemplary job of maintaining a presence on different social media accounts; she strives hard to engage with every community. Check out Page Flutter here! Shelby is the owner of Little Coffee Fox, and one of the reasons I find her to be one of the most inspirational accounts for 2018 is her willingness to bring other people into the community! She actually has a lot of guests who write for her blog, which provides the advantage of different perspectives and options. Make sure to read Shelby’s post about her List of 100! 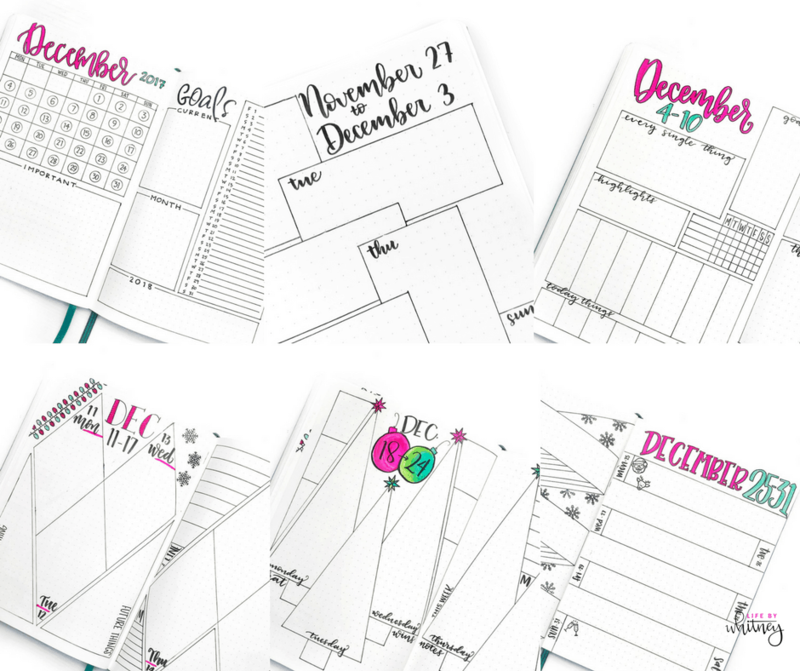 She also really covers any topic related to planning, art, and organization, so Little Coffee Fox is a terrific option for those who are looking for everything in one place. Head to Little Coffee Fox here! 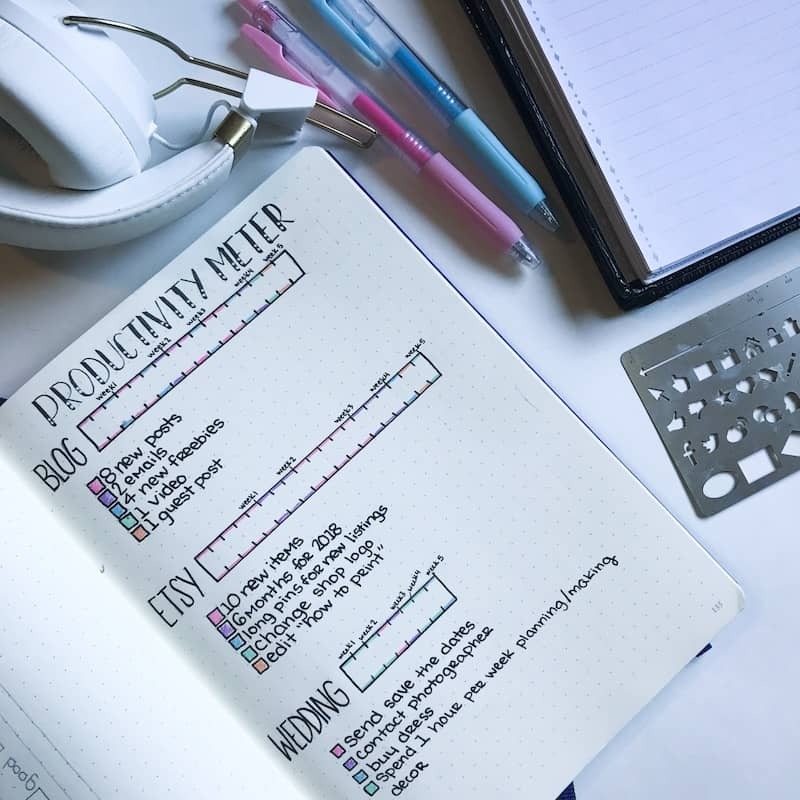 Erin has a terrific blog that really highlights different tools that help build a bullet journal to its peak. She has a solid grasp on different notebooks, pens, markers, stencils, and printables for bullet journals! Not only that, but she offers tutorials on how to use them effectively! Check out Erin’s post about the Productivity Meter! And this tendency extends beyond bullet journals! If she knows of a tool that will make your life easier, she is not shy about sharing it with her community. Check out Petite Planner here! Kara at Boho Berry has amazing Bullet Journal content. But what I really admire about her blog is how attentive and giving she is to the bullet journal community. She always has great ideas, clever spreads, and even an entire tribe of fans that love how she engages with others. She’s also an amazing artist with a unique flair, so if you love funky art, you’ll love what Kara has to offer! See everything that Boho Berry has to offer here! Sheena is such an inventive spirit and is always finding new ones to engage her community! I love her ideas for posts and she’s never been afraid to do things a little differently. She can write a post about a common topic and find a way to put her own unique twist on it. Sheena even offers this as a printable! Click here to check it out! Her tone is lighthearted and fun, and she’s a terrific teacher and artist. Her enthusiasm and liveliness make her a superb choice for inspiration in 2018! Christina is a girl after my own heart! I love her honesty and desire to help other people improve their lives with bullet journals! 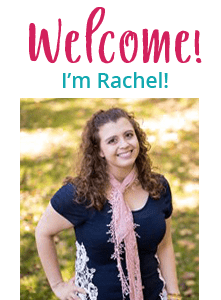 She is a terrific inspiration source to those who are new to bullet journals because she offers help and guidance to make sure her readers know exactly what they need to do to succeed. Take a look at her website here! While many of the bloggers I mentioned have Instagram accounts, there are some who are still building their blog (or don’t even have one). But many of these have terrific social media presence! 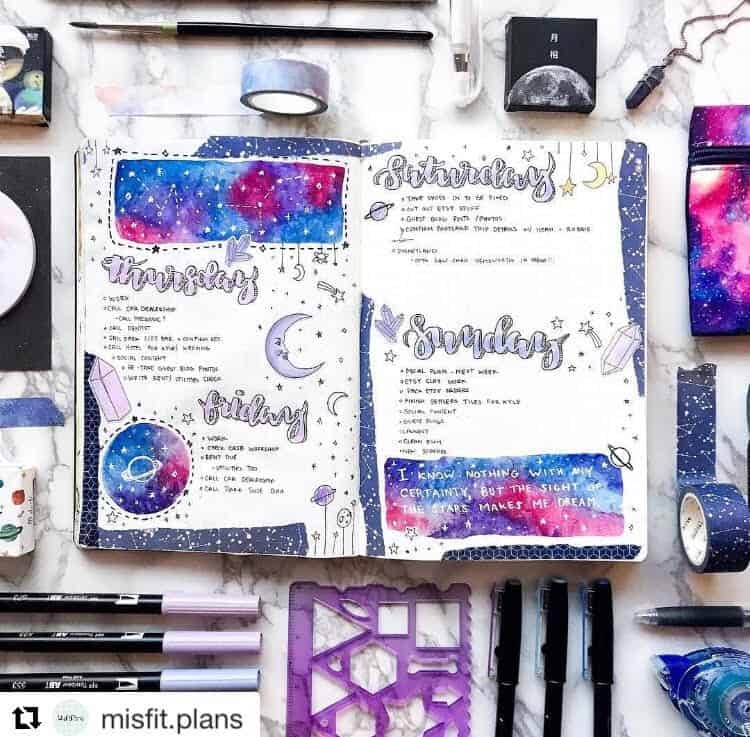 One of the best places to showcase that in the bullet journal community is Instagram! I’m introducing each account with their given Instagram name, so if you ever search for them, you’ll find them faster! Bumble Bujo, or Kim, came on the Instagram scene almost in the same timeframe that I joined. One of the key differences in our accounts, however, is artistic talent. SO spectacular! Her Instagram has even more! She’s been featured by Ryder Carroll (creator of the bullet journal) three times on Instagram, not to mention countless other feature accounts. Talent aside, she is one of the nicest and most supportive people in our community. She’s down to earth, funny, and always great to talk to. Her talent for beautiful art is none other. You’ll always find a friend and inspiration in her bullet journal. You’ll find her fabulous Instagram account here! Ashlyn has been another extraordinarily kind person in our bullet journal community. She has a unique flair for organization that is both pretty and functional. She also features different accounts every Saturday! You will love her adore her bullet journal. She’s a terrific artist! Liddy is primarily an Instagram account (though she’s very supportive and active in some of the Facebook communities!). The reason she is a feature account for 2018 is that she has such an artistic eye and is one of the most talented doodlers and watercolor artists that I’ve had the pleasure to come across. Gorgeous holiday mood tracker from Instaliddy! Click to see more! She’s also very non-traditionalist when it comes to her bullet journal spreads, so she’s perfect for bullet journal artists looking for super unique ideas. Check out her spectacular Instagram account here! 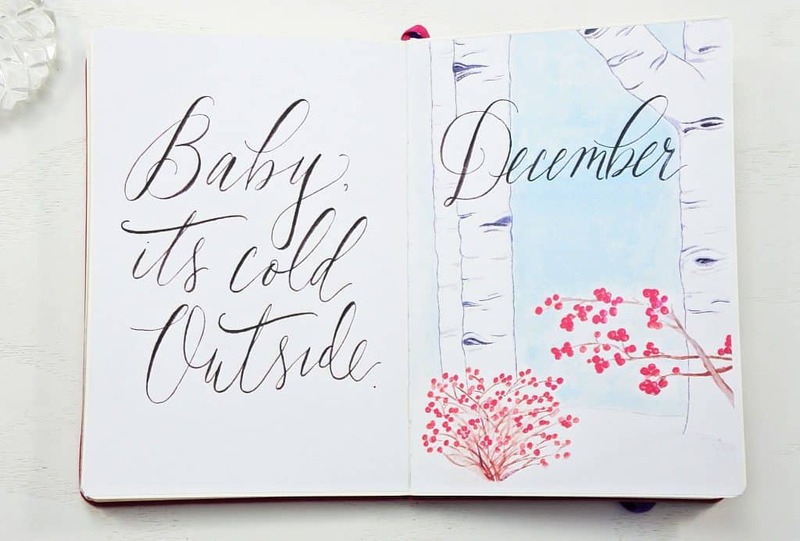 You’ll actually find Kathryn all over the internet showcasing bullet journals! But there’s a reason that I chose her Instagram as her featured account. She is so amazing at sharing the talent of other artists in the community. Multiple times per week she will work toward finding amazing content and share it for all to see. I think it’s honestly very selfless and kind of her to do all that work. 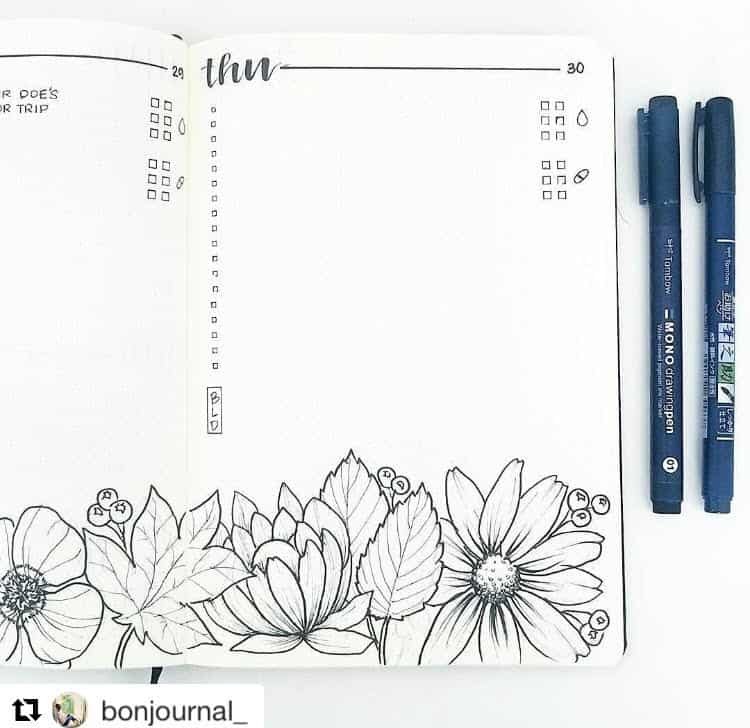 Amazing spread by bountifulcolours, then shared by showmeyourplanner! Not to mention she features many of them in her blog posts as well! 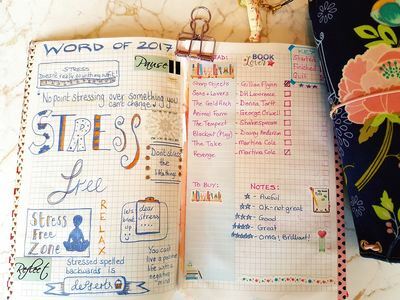 Find her super inspirational bullet journal Instagram account here! Meet Alex of Misfit Plans! I absolutely love her Instagram account. It’s creative, it’s clean, it’s original, and my goodness she is so talented. I’ve never seen another person show such a level of beautiful artistic variety, not to mention all of the bright colors she uses in her spreads. Oh, another goodie about Alex… she’s a staff writer at Little Coffee Fox! (No surprise that both are on my list, then!). You’ll find her super fun Instagram here! Liz at bonjournal_ is such a sweetheart. She is crazy talented, but one of the things I love most about her account is her desire to help people grow in their art. She’s always posting amazing ‘how to’s’ that are easy and fun. Liz has a terrific Instagram, so make sure to check out everything here! Additionally, you’ll never be bored looking at all of her gorgeous art! You’ll find this helpful Instagram account here! I’ll admit that video isn’t probably my forte when it comes to learning content, but I know so many people appreciate the visual and audio format when it comes to learning how to start a bullet journal. If you find reading articles about bullet journals a bit tough, you may enjoy watching “plan with me” videos on Youtube. A “plan with me” video is a video that actually showcases how the artist sets up their bullet journal. Super informative and great for those kinesthetic learners! Amanda was one of the first YouTube accounts I came across, and that’s because I already was a huge fan of her content on Instagram. I guarantee if you follow many accounts on Instagram, you’ve come across AmandaRachDoodles account in one form or another. Why I chose to feature her primarily through YouTube is that she is so down to earth and personable in her videos. She’s very descriptive and makes bullet journals easy to understand. Her videos are also beautiful; she has an incredible talent for media creation on many different channels. Fun fact- did you know she just graduated high school? That seriously blew my mind. She is SO talented. Check out this incredible YouTube channel here! Jenny is an incredibly talented artist and probably one of the most artistic accounts I follow on Youtube. I also enjoy her down to earth style, but I also enjoy her unique ideas and creative perspectives. She’s always aiming to try to improve processes. I’ll admit she’s introduced me to a lot of tools that I would have never thought to use in my own bullet journal! If you really love her work but struggle to emulate it, she’s got you covered! She has a terrific Etsy account where she has lovely printables, stickers, and other items for beautiful bullet journals. Check out her Youtube Channel here! It’s not hard to understand why Pinterest is one of my favorite sources of inspiration when it comes to bullet journals. You get a plethora of great blog posts and inspirational sources from Pinterest! One of many inspirational bullet journals you’ll find on Pinterest! The other thing I like is that you’ll find that there are a lot of bloggers who aren’t necessarily bullet journal/planner bloggers, yet may have a handful of articles on the topic in their blogs. This is great because you can find new ideas and perspectives from people who don’t necessarily focus on this for their living. While many of the other accounts mentioned above have their own Pinterest pages, there are two in particular that I came across specifically through Pinterest. I feel like both of these accounts are very creative and inspirational; they also are very supportive of the bullet journal community and frequently repin content from other bullet journal sources. 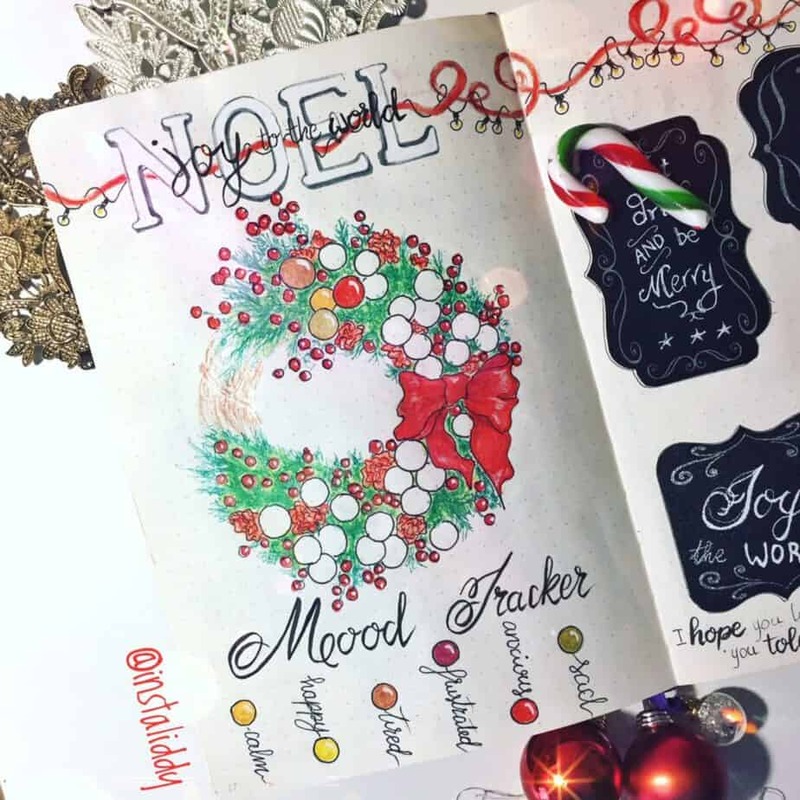 Sandra is a lovely, creative bullet journal artist and fellow planner! We were acquainted as her bullet journal group board was one of the first I joined when I started on Pinterest. What I love about Sandra’s Pinterest is that she really encompasses any aspect of life that you can put in planners. Yes, she does have her typical planner and bullet journal boards! Sandra also has tons of content on fitness, productivity, minimalism, blogging, food, and many more aspects that many people manage in their planners. Sandra also has a blog AND a shop! She has loads of great printables and stickers to help you organize your life. Check out her Pinterest account here! Kerry is a lovely crafter blogger, but my first interactions with her are on Pinterest. Like some of the other accounts that I’ve featured, she actually features more than just bullet journals! She promotes and writes content on art, mixed media, paper crafts, planners, traveler’s notebooks, and DIY. Check out her Pinterest here!!! 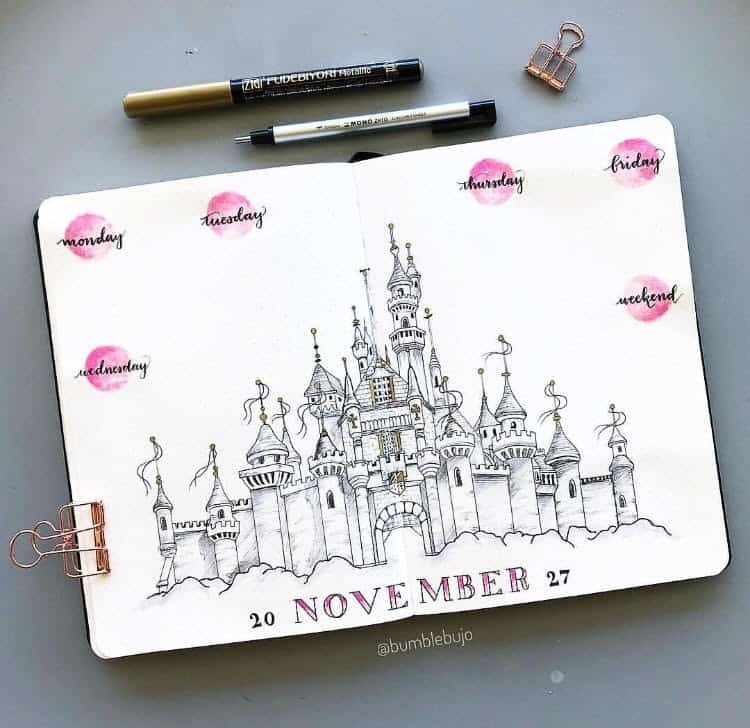 She’s a great account to follow for a bullet journal artist because she often repins content that is really fun and unique for bullet journals. And knowing how many bullet journal artists enjoy crafting in other forms, you’ll find a lot more if you need a bit a variety! Love her word of the year page on her website! You will always find great ideas following her on Pinterest. 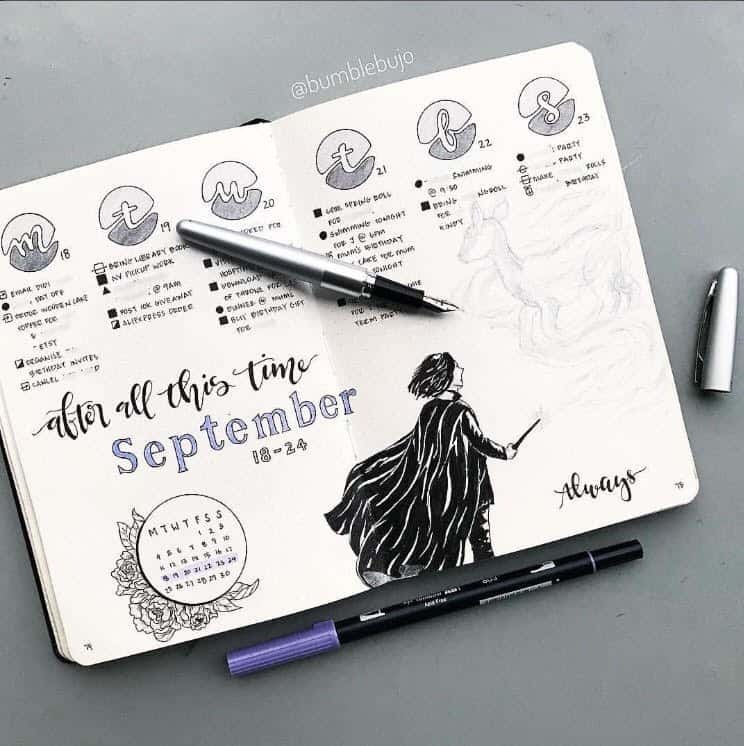 Another amazing spread by bumblebujo! By now, I’m sure your mind is blown by all the talent and options from all these bullet journal accounts. As a quick aside, a huge shout out to Ryder Carroll, the creator of the bullet journal! Many of these popular bullet journal accounts have been working with him, and he is a big part of what ties our community together. Without him, this article couldn’t even exist! I hope this gives you the boost you need to start 2018 off with plenty of inspiration and ideas for your bullet journal. Oh! If you came across any tools that you have to know about, I write about many of them in other blog posts! You can read this post about my seven tools to make beautiful bullet journals, or read this post about how Amazon is a one stop shop for most bullet journal supplies (including many of the ones seen in this post)! Also, please tell me what your favorite thing you discovered from these accounts are in the comments! PS- For those who are super passionate about bullet journals, the blogging community is wide open! It’s been an incredible journey, so definitely consider starting a bullet journal blog. You can read an article about it here, or feel free to contact me here if you have questions. by sharing this on Pinterest! Kerry- Thank you for all you do. The accounts I chose are a big part of what helped me get started with my own bullet journals (and even my blog!). I appreciate you! Merry Christmas! Rachel I just want to say that this is just THE BEST blogpost I have found for people starting out on Bulletjournalling, – or anyone really that has a bujo. Though I am an experienced mixed media artist, I am a newbie to bullet journalling (started in October) and this has just been brilliant. Of course I had stumbled upon many of the people you mentioned already, but it is just wonderful to have them all gathered here in one place with all the links provided. Thanks so much for that, I know how long it takes and just want you to know I really appreciate it!!! I have bookmarked this page and pinned it to my own Pinterest bullet journal board, and will be returning to it often I am sure. Thank you and have the most wonderful holiday season and all the best for 2018!! Thank you so much for sharing this with me, and I’m beyond grateful that this is benefitting you so much! I know that it’s overwhelming when you start… and that’s just getting everything set up! Everything on here, on Pinterest, on Instagram… it’s all to help you. Yes it takes work… but you know what, you deserve your time! And you deserve getting inspiration, efficiency, fun… I hope it continues to help you. Thank you for the well wishes, I hope your holiday was lovely as well and have a great 2018! Feel free to reach out if you need anything! Just started my bullet journal today, and am very grateful for this thoughtful list of inspirational people to follow. Looking forward to learning from this new experience and getting the most out of it. Thank you and Happy New Year! Amanda- That’s terrific! Every account has been so inspirational for me, and I hope they offer the same for you. Happy New Year!